At the 2015 New York Auto Show, BMW North America CEO Ludwig Willisch told AutoblogGreen that the company plans to make plug-in hybrids of all its core models. 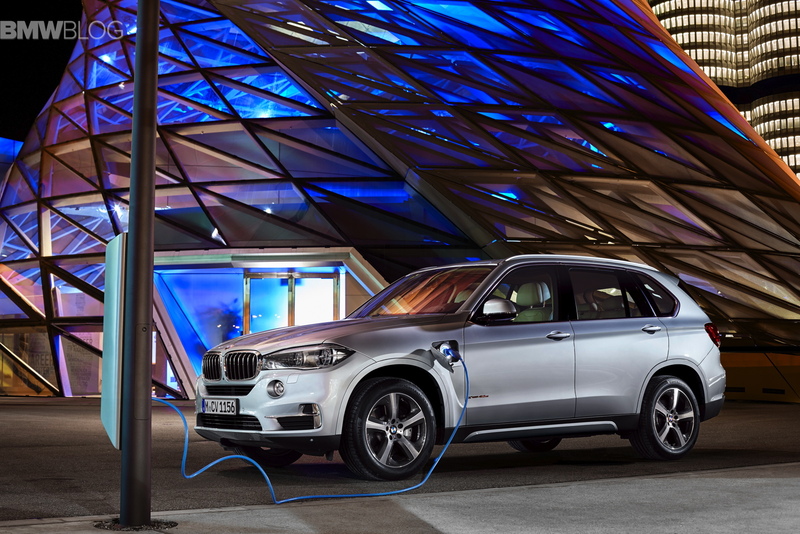 The technology used in the BMW X5 xDrive40e hybrid will find its way, in some form or another, in other BMW cars. BMW just took the wrapping off of its newest X5 for the whole world to see; the BMW X5 xDrive40e, the very first plug-in hybrid X5. With a 2.0 liter turbocharged four-cylinder and a synchronous electric motor, combining to make 309 hp, can surge the X5 hybrid to 60 mph in 6.8 seconds and get around 70 mpg. It can also run in pure electric mode for 19 miles and hit up to 75 mph. The highly-rumored BMW i5 has been the talk of the town for the last few months, but a recent report says the next BMW i car won’t arrive until 2020. The future of BMW is clearly electrified, it just remains to be seen if it will be fully electric. 11 Comments on "BMW To Make PHEV Versions Of All Core Models"
Electric motor output is 83 kW (using kW instead of HP makes it easier to compare it with other electric motors). Regen is limited to 20 kW. Charging speed is 3.5 kW (I guess it will be a while before we see faster chargers in PHEVs). And just to confirm, it will be AWD. It’s actually a very interesting vehicle, I’m wondering what the price range will be. If they can keep that deadline (Fall 2015), it will be released BEFORE the Mitsubishi Outlander PHEV, and maybe even before the Model X (if there are any further delays). Is that 9.0 Kwh total or usable? I wish they’d clarify as there is a significant difference. If usable, then this vehicle could probably get around 30 miles EPA. Otherwise we’re probably looking at around 23-24 miles. Your EPA number is too big compared to manufacturer number. going “fully electric” (assuming that means BEV) isn’t really practical. but when it comes to PHEVs, i think that the EV range should be sufficient to cover the daily driving needs for the typical driver. the PHEVs being announced by BMW and VW seem to fall short of that goal. by contrast, i think that GM has a better approach to electrification. Indeed. 20 miles of range should be the absolute bare minimum. There’s really no excuse for these cars with less than 20 miles. But, as you say, 40 miles should be the target for a PHEV. 20 miles is enough for most europeans. +charging at work makes it 40 miles and way more than needed most days. So it’s more about the core buyers and their location. It’s understandable that GM went for more since people from the US drive almost twice as much. when it comes to issues of energy efficiency, it make more sense to make decisions centered on the European market because Europe is ahead of the U.S. when it comes to energy efficient technologies. by comparison, the U.S. lacks economic incentives to motivate people seek increased energy efficiency: we don’t tax energy at a high enough rate to make people want to conserve. so people in the U.S. look at spending money to save on use of artificially cheap energy…most people look at that and say “no dice”. energy efficiency is just not a discussion that the political environment in the U.S. is capable of having right now. i guess people believe that if miami ends up 6 feet under water we can always solve the problem by building levies. I just hope they put decent sized batteries in them instead of this pathetic sub 10KWH batteries. Put in 16KWH at the minimum. The F15 X5 PHEV arrives in Aug and stops production in Aug 2018. It is then a full year to Aug 2019 until the G05 X5 PHEV comes out with the G01 X3 PHEV not arriving until Dec 2019. Both have battery underfloor where it belongs. Toyota pledged that by 2012, all Toyota models would have a hybrid counterpart. The big difference is that BMW will have to do it to make the EU regulations. And a lot of non-european manufacturers will have to do the same, at least for the european (and most likely Chinese) market.